I love Mexican cuisine, but sadly there’s no restaurants around where I live that serves anything remotely like it. So instead I like to create some things at home – mainly burrito bowls or fajitas. I could honestly eat these 4 times a week and not get bored. Perhaps it the mix of ingredients and the flavours that keeps me hooked, but whatever it is I quickly learnt that I needed to add that certain spice mix to create a more ‘authentic’ taste. The reason I’m using the word ‘authentic’ like this is because I’m not a Mexican food expert, so I can’t tell you that x, y and z are used in authentic Mexican cooking. However this Mexican spice mix recipe is what I use to give the food that particular kick of flavour that makes my mouth water and makes the food taste amazing. I read many ‘Mexican spice mix’ recipes to add that kick of flavour, but eventually I came up with my own recipe. This spice mix is something I add to the peppers and onions while they are cooking, giving them a lovely mild spicy flavour which compliments the rest of the ingredients. 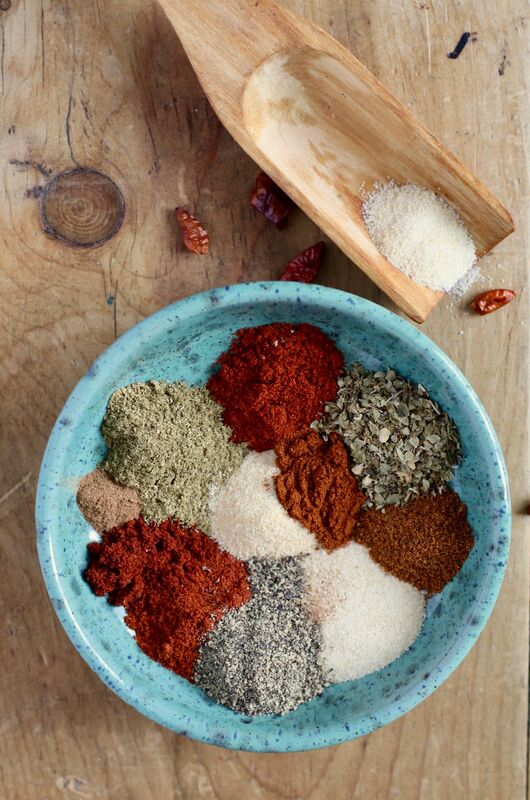 The amount of different herbs and spices may seem like a lot in this recipe, but all of these work very well together and make a spice mix you’ll want to use again and again. Additionally this mix lasts for a while as you only need 1-to-2 tsp when cooking. Top tips: Reuse jars (jam jars / nut butter jars / old herbs and spice jars) for your spice mixes. If you are using an old herb/spice jar you can double this recipe to make sure it is full. 1. Add all of these ingredients into a small bowl and mix well. This way the ingredients are mixed well before adding them to your empty container. 2. Now you can add the mix into a jar or whatever container you have and add it to your spice rack ready for the next time you need it. Note: This spice mix is great for adding flavour to many dishes, but you need to try it with burritos and fajitas! Love baking? Check out my DIY pumpkin spice mix post here.